You'll be charmed by this kokopelli clock with Kokopelli as the pendulum. Made by an artist with a beautifully finished rust color that will complement virtually any decor, this wall clock is called "Kokopelli in the Desert" and is shown above. 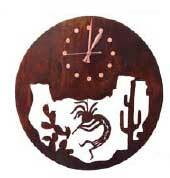 Kokopelli in Desert clock measures 14 x 18 inches; Round Kokopelli Dusk and Dawn clock measures 16 x 16 inches. Splurge and buy a pendulum clock for yourself or as a gift for someone you care about. Be ready for "oohs" and "aahs." Due to the handmade nature of this piece, variations may occur. Order to shipment time is approximately six weeks. Thanks so much for getting back to me. I actually received the clock today. My husband is so happy. He has been wanting that clock for about 4 years when he saw it on a vacation in Utah. Thanks so much for everything! It is a gorgeous clock! We got the clock today and we are very pleased with it! The clock arrived safe and sound. I ABSOLUTELY LOVE IT! It is PERFECT for my kitchen. The copper coloring is gorgeous. It makes me smile to watch Kokopelli swinging back and forth. I couldn't be happier with this clock.